Thank you to Mark for this award nomination which I gratefully accept. The rules of this award are very similar to other awards and so I will once again ignore them. This is not out of disrespect for the award itself but because in my opinion the nomination and recognition of other bloggers work are the important aspects, and recounting seven things you didn’t know about me is a side issue (and a dull one at that). I would recommend the following blogs for a view and at the same time nominate them for this award, should they wish to accept it. Congratulations Adrian! And Thanks a lot for nominating me!! I could not believe it when I read my name. I agree with Sallyann about the way you have accepted the award. I am inspired but please excuse me if I do not accept it,as I am still a rookie at this and there are so many blogs out there who I feel, are inspiring enough. So do not want to do injustice to them. Also due to time constraints I am not able to keep up as much as I would like to. Once again Thanks! Thanks Sonali. I understand your position on accepting the award, however, I have only been blogging since 1 January 2012 and so far have been nominated for 6 awards. That is not because my blog is particularly good but because there are so many awards out there. 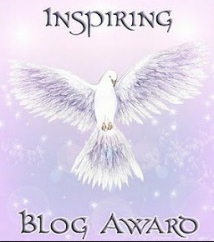 Accepting awards and nominating others is also a very good way to drive traffic to your blog. Perhaps you might accept the next award, I’m sure you will be nominated again very soon.